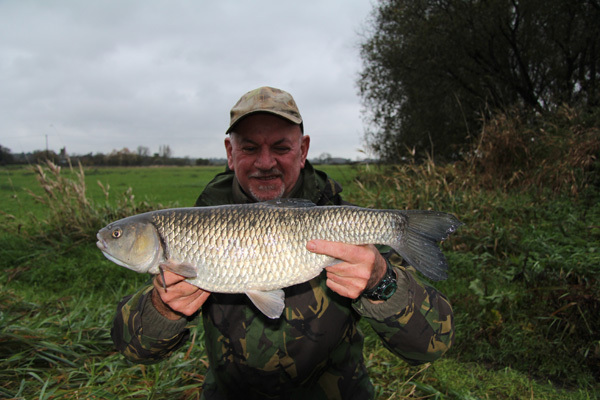 On the H’Avon and some great chub. It is that time of year again the annual visit to the New Forest for a weeks holiday. It’s also another great excuse to pack the rods. I don’t normally fish whole days preferring to fish for a few hours before darkness. My usual float fishing method is used for these few hours and it’s surprising how effective it is. My very first opportunity was on the Saturday afternoon. It had been raining Friday and most of Saturday morning. Driving back from Winchester saw the roads and fields flooded. Arriving at the river at 2pm saw it up and coloured but still had enough visibility in the river for trotting. Feeder fishing wasn’t possible due to the debris coming down in rising river. I started off in a swim where there is slightly slacker water on the far bank near some trailing branches. Home of some very big chub. The rain was pouring down as I cast across and trotted the far side. Feeding maggots in every trot down to induce the chub out from the snags. After 30 mins of doing this the float shot under and the rod hooped over and I was playing a fish. It was not the thump of a good chub but it shot down stream and leaped. Yeap a sea trout showed it’s displeasure at being hooked. It fought well in the strong flow but not like a chub. It was only about 2lbs but at least a fish. The rain still poured and you could see the river rising rapidly and colouring as the time went on. I’ve not seen anything like it on the H. Avon before. All that water from the forest must have been entering the river now. The rain didn’t relent either. The conditions got so bad it was impossible to keep the maggots and gear dry enough for good presentation. I finally called it a day as the light began to fade. Sometimes you need to dismount that horse! The next day Sunday, my mate Andy (you should have been here yesterday) Cowley was fishing the same stretch of river. I had pre-warned him of the conditions of the river and suggested he bought down a barbel rod too. I woke early in the morning to the valley being covered in fog. Up on the hill where I stay the sun shone brightly. Me and Mrs.P went for a walk in the forest and towards the river and found that the visibility had improved and you could see into 2ft of water. Now that’s enough for trotting for sure. A quick phone call to Andy had him confirm the foggy conditions early in the morning and to say he drew a blank on the barbel front. He had just changed swims to begin trotting. Great news! Soon after lunch I was on my way to meet Andy. On arrival the heavens opened and I sat in the car for 15 minutes while the storm passed. So on with the water proofs and gear loaded on my back off I set. The colour had improved and was getting better as the day went on. Having located Andy in a swim where there are normally 20 chub I wasn’t surprised to find that he had landed 3 chub and a sea trout. If I remember rightly two of the chub were over 5lbs. I settled down in the same swim above him and started trotting and feeding maggots. The wind and further rain didn’t help the presentation but at least it was an improvement on yesterday. After about an hour I hooked into a chub that bounced off. Then quickly hooked another that tried to fight it’s way under and into the trailing branches. The float rod was bent right over as I steered it into mid river. This was not a small fish for sure. The flow was so strong I decided to guide the fish down to slacker water slightly downstream. I can never resist pulling the fish up into mid river to see the size (they often come up by themselves). This fish came up and it looked really big. I guided it down past a midstream snag so that didn’t come into the equation of landing it. I was nearing the slacker area and was just guiding it past a small piece of outcroped bank when the hooked pulled. Bugger! Or something like that was said. It was a good fish too over 6lbs for sure. Andy in the meantime was landing some excellent chub. The conditions looked spot on for him. I walked down and told him the sorry tale. Where he was putting his maggots in you could see the surface swirls where the trout and chub were in competition for the feed. He was for sure going to have a great session. I had enough of the swim and decided to move to another swim where I had seen some huge chub earlier in the year. I had already had a 6lber from there so I was hopeful . I arrived and put out some hemp and maggots via a dropper into the area I was going to fish. I had about 90 mins left of daylight. Well after 45 minutes nothing showed no line bites or pulls absolutely nothing on the feeder. Then I saw a chub move further upstream and cast into that area. I did cast about 5 times to get the maggots into the swim. Whilst I was doing this some people on the far bank spooked two deer and splash they came right through the swim and swam to my side of the river. Well things were sure going to be quite now. Time continued to pass when the tip flew round and I hooked a very angry chub that took line from the spool. However the Korum quiver rod has sufficient back bone to halt the fish. Having 5lb hooklink will hold most of the chub on the Avon for sure. This fish fought really hard in the fast current then the hooklink broke. What happened I’ll never know there wasn’t much pressure on the rod or line because once they are in mid-river then they are yours or should be. Bugger again! Two good fish lost not too good. It was too late to retackle again and with a thunder storm overhead it was time not to be holding a carbon rod. I agreed to meet Andy for a chat before he returned home. 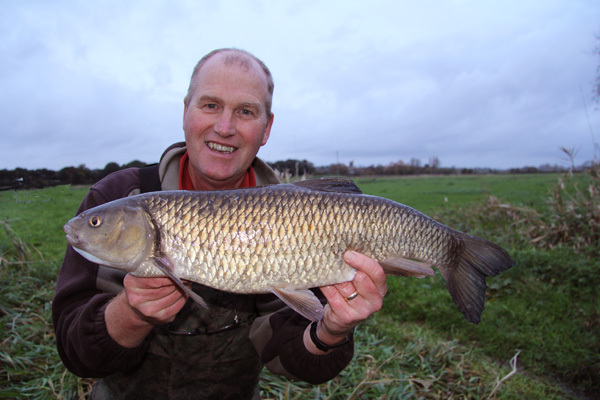 He did say it was unusual for someone to lose two 7lb plus chub in one session. The little chat ceased soon after this! He had a great time I think landing 8 chub of which I think 6 over 5lbs and the best going 5lbs 13oz, Fantastic fishing under difficult conditions well done him. So the next day I started again float fishing one of the better swims that has produced some good fish. I met Mike whom I hadn’t seen since last year. He told me he hadn’t fished too much on the river this year and was looking forward to some trotting for chub. We had a brief chat before I headed off to the swim. The wind speed had been increasing during the day. I started off by spraying maggots for 15 minutes then trotting down the swim. It wasn’t long before I hooked and landed a couple of small chub of about 4 lbs or so. 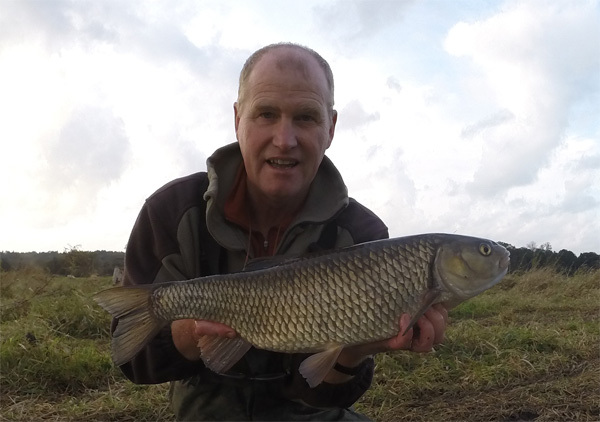 Then I hooked and played a lovely big chub that had the line singing in the wind as it came towards the net. On the bank she went 5lbs 7oz and was a lovely looking chub. I had one more chub before the wind increased to levels that caused the presentation of the bait impossible and no self respecting chub would look at the bait. So it was a rethink that had me heading towards another swim that I knew held some big fish. Mike came along to see me bait dropper out some reds into the area. I only had about 90 minutes in the swim. However the river had cleared since fishing the day before with Andy and the area looked so good. A slacker area out of the main flow with a few branches in the water just screamed chub. Sure enough it wasn’t long before the feeder was cast into the slack. It was an upstream cast which would inevitable mean a drop back bite when the chub took the bait. This happened 4 times with 2 smaller 4lb chub and one which went 5lbs 5oz and the largest of the lot was 6lbs 2oz. It was wonderful fishing. 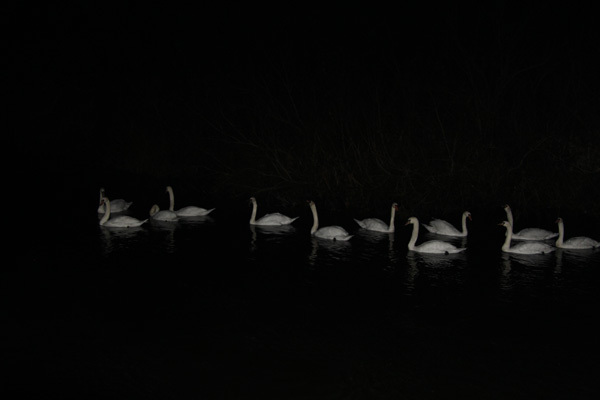 I couldn’t wait for the next one when all the swan population came up and sat right over the baited area. The swim feeder went around one of the swans neck and came free and that was it no more fishing for me. To be fair the light was almost gone and it was time to go. Wow that was 8 chub in a very short time span and a 6lber too, Happy Days! How I was looking forward to the next day fishing for a few hours with Graham a mate of mine who moved from Wales down to Dorset. I had not met him since tench fishing together in May. Moving house was busy for him and he also starred in “A place in the Country show. This was first shown on TV the end of September. Well done Graham. We met on a very wet and windy afternoon. The colour of the river was getting worst visibility disappearing by the hour. Having got his ticket sorted and new supply of maggots we were soon trotting a beautiful swim where there are 20 chub or so in residence. Me feeding maggots and Graham trotting had the chub going bonkers. Only joking we couldn’t buy a bite from them. The only result was a solitary dace. So whilst he trotted I assembled the Korum river feeder rod a 1oz tip. The main line was 6lbs with a size 18 hook on a 5lb hooklink. Sometimes I go down to 3lb hooklink however with the colour and visibility being poor 5lb would give us the edge on preventing any breakages by chub heading off to the snags. So with the wind now making trotting difficult and an hour wasting maggots there was only about 90 mins left to fish so we made our way to the next swim. This was on a great bend in the river with an area of slack on the far side. The rod though needed to be held high in the rod rest to reduce the amount of line in the river because of the huge amount of debris coming down. By casting upstream the bite would be drop back bites. So first job was to bait drop out some maggots with about half a pint going in. Graham didn’t need to wait long before the tip bounced over and then back with a classic slack line bite. Just like up tiding for cod in a boat. Graham just lifted into the fish and pulled it into mid river away from the trailing branches in the water. The fight was not spectacular and after leading the chub downstream to a slacker area I slipped the net under a small chub of 4lbs exactly. Out went the feeder again and I guess within 15 mins the tip rattled again and the line went slack. 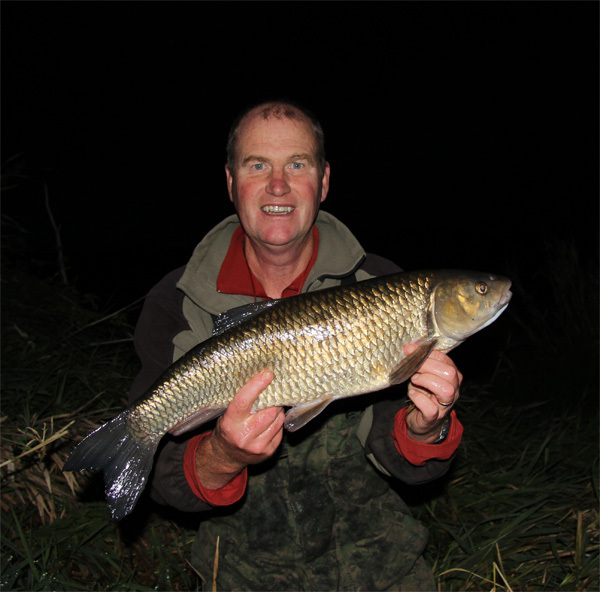 Graham was on it quickly and lifted into a good chub that fought really hard to gain access to the trailing branches. However the 5lb hooklink meant that Graham could exert a fair degree of pressure on dissuading the fish to go into the snags. This fight was really great the fish powering off and trying to get into the snags frequently. As we moved down the fish soon tired and we landed them in the slacker water downstream. It looked to be a good fish and on the scales it went 5lbs 3oz. It was Grahams pb what a result. A low pb however Graham normally fishes for tench, carp and competition fishing for trout so doesn’t fish the rivers much. Something that will change now he lives down in Dorset. Well a few photo’s complete and fish returned the rod was recast. Now with this fishing the chub do pull the feeder and dislodge it at times however they are not hooked. 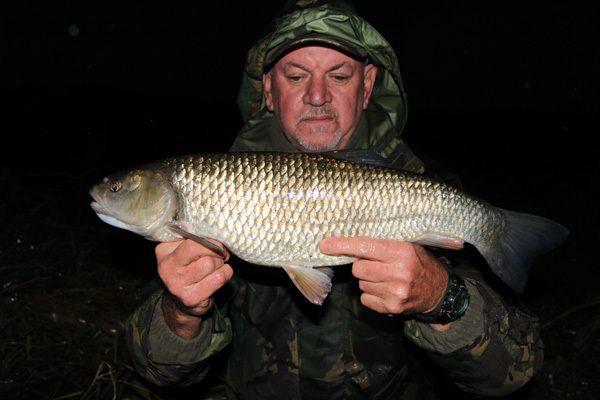 You also get plenty of whacks on the line from chub tails as they mop up the maggots. It’s a great way of telling that they are present. Sure enough and another 15 mins passed and the tip jumped forward then back and the line went slack. Wow this fish pulled really hard at first however once it’s in midstream the fight is normally over and it’s a cast of keeping the fish out of trouble. Graham did this magnificently and we netted it in the slack water. When lifting it from the water I knew it was a larger chub. She looked a good 5 and perhaps a 6lber. On the scales she went 6lbs 4oz and a new pb for Grayham. What a time he was having. I was so pleased for him. Once the photo’s were completed darkness, rain and the wind intensified we had time for one more cast. After a few taps on the rod top from chub still feeding the line slackened and for the last time of the day Graham lifted into a good chub. It was so dark by now we couldn’t see where the line entered the river so couldn’t gauge where the fish was, so Graham moved backwards and from the angle of the rod tip the fish was in midstream. Again from the fight it looked to be a another good chub. It came to the surface of the river in mid flow once or twice and splashed it’s tail to show it’s defiance in being played. So once in slacker water I netted another fine chub for Graham. It looked another big fish and sure enough on the scales it went 5lbs 12oz and a beautiful looking chub. Well done Graham. Our next adventure together will be fishing Throop probably in December when most of the weed will have been washed away and trotting is possible. However this feeder fishing isn’t too bad either. That was it with the rain pouring down and it being practically dark we called it a day. What a great 90 minutes of action. 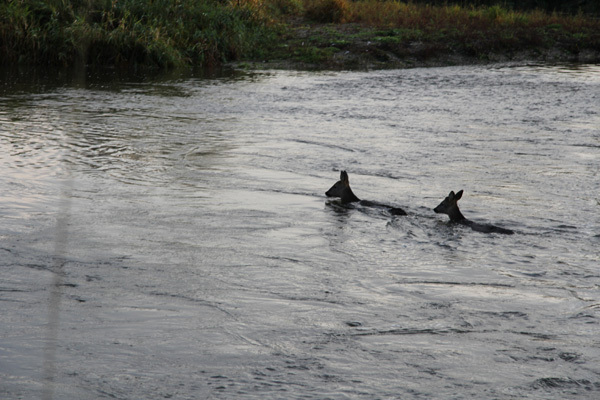 It just goes to show that whilst trotting does out fish feeder fishing when the water is clear. Today the best method was feeder fishing. The chub wanted a static bait for sure. The rain intensified as the evening went on and during the night it poured even more. Think this could spell the end of the chub fishing for me and this holiday. The next night I couldn’t fish as I was visiting my Niece near Blandford . It had rained all day and things didn’t look good. The Stour was about to burst it’s banks too. Anyhow after a all too brief trip to Southampton during the morning (the wife complained it wasn’t long enough, West Quay and all that) I got my ear bent all the way back to Fordingbridge. Needs must however I didn’t say this. You in the know will understand what I’m saying. So plenty of hugs and kisses and I was in the clear. Hope Mrs. P doesn’t read this. So I set off to the river at about 2pm. There was a car there already and I knew it to be Mike. I didn’t unload the car but walked to the swim I wanted to fish. Mike Window was downstream and finding it hard to hold the river bed such was the debris coming down. Mike was kind enough to test the holding area that I wanted to fish. Sure enough with 3oz he could hold out. 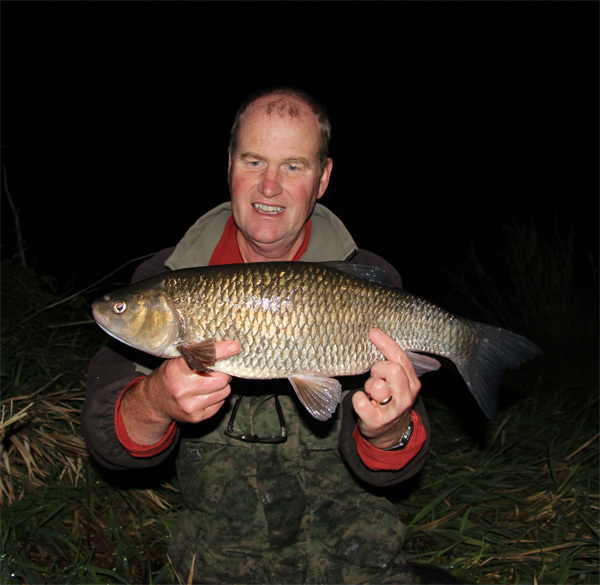 I gave him the first choice to fish the area as I knew he was after barbel. I think he had a 15lb fish from the area last year. He was very kind and said you fish it. So I almost ran back to the car collected all the gear and returned to the swim. First thing was to cast the 50g feeder to see if I could hold. Affirmative all looked good, again I was casting upstream and holding well. I did this first before putting in the bait. 4 droppers of red maggots were put into the swim. I then tackled up and went for another natter with Mike. I knew that time was important as there was so little light left. We talked much about people and friends. 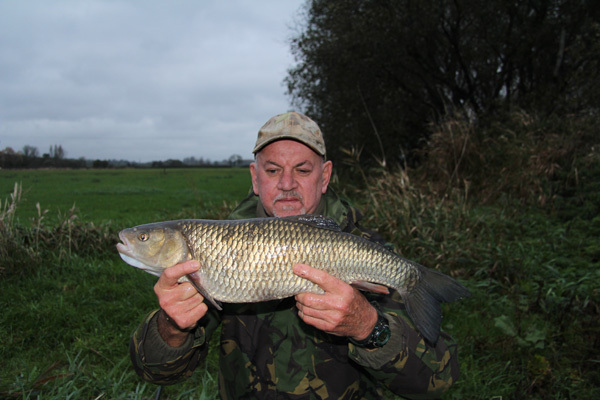 At 3.15pm I cast out and within 10 mins had a nice chub of 5lbs 2oz which was landed close to Mike’s fishing position. Then within another 20 mins or so I had another of 3.5lbs, I was feeling deeply embarrassed by this as Mike was having problems holding bottom where he was fishing. The last knockings had me once again hooked up and this fish felt like a good one. I only just got it free from the branches in the river. Once in midstream the fight was won. However with the river up and running fast I asked Mike who was packing up to help me net it. He did a great job and helped me weigh and photo the chub which I thought would be close to 6lbs. On the scales 5lbs 10oz was still a wonderful result from very difficult condition. I thanked Mike for letting me fish the area. I think he couldn’t quickly enough see the back of me. So that was it for me! The worst chub conditions you could imagine however a great time in wonderful company says that it’s not about catching. But some good fish along the well helps. This entry was posted on Friday, November 14th, 2014 at 9:03 pm	and is filed under Uncategorized. You can follow any responses to this entry through the RSS 2.0 feed. Both comments and pings are currently closed.